While not one of Yosemite’s tallest peaks, at nearly 11,000 feet Mount Hoffman is still respectable. The spelling of the name seems to vary between Hoffman and Hoffmann I’m not sure which is correct but Ansel Adams referred to it by the former and that’s good enough for me. I took this shot on the same evening as a previous post. Shooting star trails were the goal of the trip for me so this was just a bonus. Having endured many a cloudless sunsets from the top of Sentinel dome, this one was a real treat. The big lenticular cloud over Hoffman was the icing on the cake. To make this image I used my Canon 5D. The relative closeness of the scrub in the foreground required an aperture of f/16. At this point some folks would be reaching for a hyperfocal chart but that’s all a bit too formal for me. When dealing with such a large depth of field (DOF), I generally will focus on the foreground element most important to me and then adjust the lens to just beyond that point. The result is a sharp foreground and an acceptably sharp background. 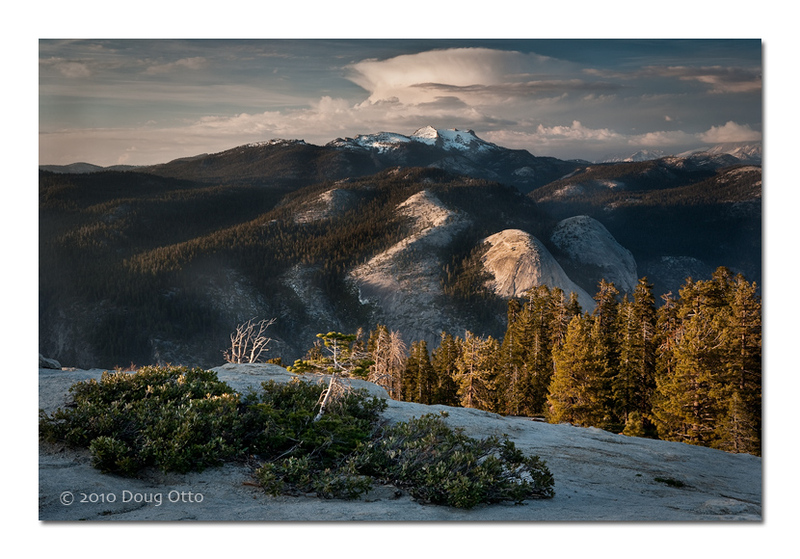 This entry was posted in Photography and tagged basket dome, Canon 24-70 f/2.8L, Canon 5D, doug otto, lenticular cloud, mount hoffman, north dome, Photography, Sentinel Dome, yosemite, yosemite national park. Bookmark the permalink.